The no points, “submission-or-decision” version is a platform to showcase jiu-jitsu skill at the highest level – and we are all glad to have the opportunity to experience it. Does the ‘Bad’ Overshadow the ‘Good’? There were some great jiu-jitsu matches: Rafeal Lovato Jr vs. Andre Galvao, Brualio Estima vs. Rodolfo Vieira, and Kron Gracie vs. Shinya Aoki (despite a prolonged “feeling out” process in the beginning). Things took a turn for the worst in the highly-talked-about match between Roberto “Cyborg” Abreu and Brendan Schaub (video). Abeu, who did just about everything he could to engage in the fight, was highly disappointed afterwards (despite winning by decision). Athletes come to an event like this to both test and showcase their skill in grappling. Abreu wasn’t truly given the opportunity, and Schaub’s “nullification” of Abreu’s jiu-jitsu was borderline disrespectful and his strategy, confusing. As a student of Gracie Jiujitsu (Joyce) and who has had the opportunity to speak and train with both Ryron & Rener Gracie (Schaub’s jiujitsu trainers), I can say I understand what the Gracie system is all about. Obviously Gracie Jiujitsu works and is a highly-refined martial art, however when you put a brown belt (Schaub) up against a 12-time Grappler’s quest, 3-time World Nogi Champion (and many more accolades) back belt (Abreu), you can only hope for one thing in my opinion, to survive. In addition, the thought somewhere in Schaub’s brain, were UFC President Dana White’s one condition for taking this contest, “Don’t get hurt.” Fortunately or unfortunately for Schaub, it was just his reputation that got hurt. The only problem that I see in the Metamoris Tournament is in casting. I believe that the matches should only be performed by players of black belt level or higher. Furthermore, the black belt must be in a grappling-based system of martial art. 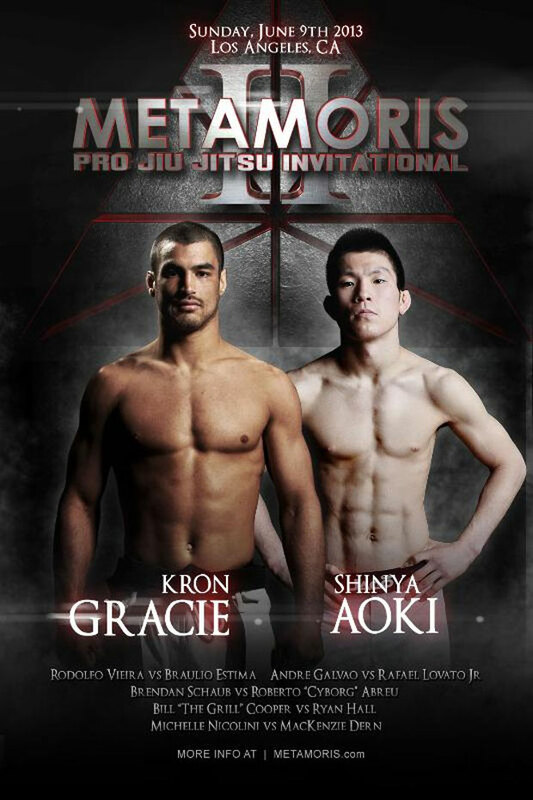 Metamoris does not need to be in the game to bring in “big names” (such as those in the UFC). Audiences around the world wish to be riveted by high-level, submission-only grappling and while some competitors can be found in the UFC, Pride, etc, the focus should remain on those whose grappling game holds a high degree of depth and intelligence. It arrived the Summer of 2011… and finally the world has a women’s self-defense curriculum that not only is presented in a fun and energetic manner, but one that covers the wide array of violent situations with quality instruction and the attention-to-detail that the Gracies give time-and-time-again. This review is intended to be “no-holds-barred” and will give the reader not only the strengths but weaknesses of this dvd series from both the viewpoint of a professional self-defense coach and from a beginning student. Before I dive into the meat of the series – and what a succulent morsel it is – let me begin by saying that the roster is beyond exceptional in that they include two wonderful examples of “Women Empowered” in Eve Marie Torres and Sage Gracie. Their comments are invaluable in both helping the beginner understand the pitfalls and difficulties common when anyone begins a training program and the fact they they are women helps to reinforce the female viewers that the techniques can be done effectively with the natural, inherent strength that all women possess. Ryron & Rener (and later, Ralek) provide most of the technical advice as well as providing answers to common mistakes & questions from students they’ve had in previous classes. After popping in the first disc and hearing them welcome you with such openness and sincerity… it’s easy to not only get excited about learning, but excited about DOING… which is (or should be) the most important characteristic of ANY learning series. Rener Gracie is like the self-defense version of Tony Robbins. He is so motivating and as he moves and makes some of the most interesting facial expressions, you can’t help but to have more focused energy on the task at-hand – learning self-defense! DISC ONE really gets the ball rolling by discussing the enemy (strangers/non-strangers) and the “Triangle of Victimization.” What was a pleasant surprise to me and something I deem a necessity (in teaching self-defense) a strong emphasis on what the Gracies call the “Base Get-Up.” Balance is crucial in self-defense and nothing rattles/confounds a woman more (initially) knocking her off balance. (Regarding the “Base Get-Up) In the words of Eve, “It is not the most lady-like, but it IS the safest.” The most important thing to take (after viewing) is that you shouldn’t expect to have the technique when you need it most if you don’t use it in everyday life. Learn the “Base Get-Up”, train it and make it an organic part of your movement. Having the women perform the techniques gives the viewer relatibility and identification in the movements. In terms of video, every so often the camera would zoom in on a specific body part during the techniques which is extremely helpful for the student viewer. Again, the Gracies begin at the beginning, and add what many instructionals (books, dvds, etc.) leave out; how to prepare your body for an attack. In this case, tensing your neck muscles in order to resist the pressure on your windpipe. There are some pros and cons when it comes to the “Super Slap” (endnote 2.1), however, (as someone who has taught women’s self-defense for over a decade) I can see why they choose this approach. Regarding the remainder of the disc, you receive what Rener & Ryron consider one of the most important (if not THE most important) technique of the entire series… the Guard Get-Up. A great deal of fear comes when your assailant has you on the ground. In this gem of a technique, the Gracie brothers show the viewer not only show an effective and energy efficient escape, but distraction techniques (i.e. Super Slap) and distance builders (as pictured to the left). The front choke defense and guard get-up feel very practical. The guard get-up is my favorite because it provides hope when you are in a panic-causing position whereby the predator is between your legs. When this happens, this technique is very useful. In this disc, the viewer/practitioner (having 6 lessons under their belt) really begins to learn that what might have worked in one scenario, might not work in another. In self-protection, variables change and it’s very important that the student knows not only how to remain relaxed/confident in their actions but also how to recognize when something doesn’t work. Beginning with the Stop-Block-Frame, this disc offers the viewer a sturdy support system for any attacker that encroaches within your personal boundary. In three distinct “slices”, the Gracies effectively show the student, first, personal defense with the attacker outside of arm’s length. “Slice 2” covers how to “Brace & Base” when the attacker makes contact, and finally (slice 3) shows “The Frame” technique (for those persistent buggers who won’t take a hint). *It should be noted (in my opinion) that the Stop-Block-Frame is somewhat flawed (see End Notes). Lesson 8 & 9, however, is endorsed with the highest enthusiasm. There are many variations of techniques in the self-defense world, but when an attacker (for example) mounts his victim but is supporting his weight strongly with his arms or (possibly a scarier & more common scenario)… he’s pinned your wrists! What do you do? Again, these “Extras” are perfectly placed to optimize peak performance and diminish the “quicksand” that many self-defense professionals call “The Fear Loop.” The disc ends with a popular jiu-jitsu technique known as the Triangle Choke, which utilizes the strongest asset a woman has (her legs) against the attacker’s neck. The ability to render your attacker unconscious is bound to empower the female viewer to new heights. An important aspect however, that is rarely touched upon in weapon defense is what we should do (or expect to do) if we manage to disarm our opponent [see endnotes]. The guillotine chock happens to be one of my favorite moves. Perhaps because I am always able to use it when my husband and I practice self-defense and other times when we are play-wrestling. For some reason, he loves to go head first into me and then that’s when I pull the choke. All the other moves are also fun, but are not quite as easy to perfect as this one. In this disc, the Gracies explain that (if you so choose) after reaching a solid foundation regarding the mastery of these techniques, you may want to make a qualifying video of yourself to be evaluated by one of the Gracie instructors themselves. Not only will you be rewarded a pink belt if pass the test, but (pass or fail) you will be given a review sheet of comments and areas that need more work. With or without this step, the Gracie family sincerely wants to help keep women safe; and to be evaluated on your performance of the techniques is just one of the ways in which you’ll feel more empowered and capable of handling any future situation that you may (but hopefully may not) confront. One of the most beneficial aspects of any program resides in connectivity. The message and depth of knowledge aside, our ability to “connect,” relate and understand what women go through and may have to go through at some point in their life is (not to overuse the word) Empowering – but also comforting and reassuring. You may listen to these talks at any point in your training and segments of these are offered for free on the Gracie’s YouTube channel. “Why Women don’t learn self-defense”. Get the Women Empowerment Dvd Course and you’ll also receive two additional talks not found on YouTube entitled, Street Smarts and The College Talk; two very important additions. There is absolutely nothing like this on the market today (in my opinion). The presenters are not only young and fun, but have a deep knowledge-base and can communicate their thoughts brilliantly. Speaking from personal experience as a self-defense coach (and primarily a “Women’s Self-Defense” coach at that), I can say with 100% certainty that the lessons in this dvd series will not only empower you, but will serve as a wonderful foundation for future study in jiu-jitsu or any other martial art you undertake. Also, and most importantly, the techniques (if you diligently practice them) could one day save your life! Buy your copy today by clicking on the picture to the left or below. The Gracie self defense program, Women Empowered, is a good foundation for learning self defense. The teaching is enthusiastic and easy to follow with funny metaphors and clear imagery to help learn the step-by-step techniques. The program not only teaches you how to do a move for escape, but also demonstrates common moves that are incorrect and weak. The dvd is technique oriented and will surely empower any woman who decides to actively participate in the drills. And although the Gracies discuss the emotional and psychological aspects of attack, they forget to mention that while these techniques are being applied, you can (and likely, should) be screaming for help! While you should never rely on help, you can always improve your chance for survival (and of scaring your attacker) by vocalizing and making both your location and distress heard. I feel the Gracies should’ve emphasized the times where it is inevitable that you will get punched, feel pressure, and such. To complement that discussion should be a lesson or a reminder through every move taught to do movements that include protecting the face and center-line. Rener and his brother discuss high-heeled shoes when standing. They explain that high-heeled shoes will hinder the stand-up techniques because they hinder balance and should therefore not be used during training. I would question this because women are usually taught to wear a new pair of high-heeled shoes, especially tall ones, around the house to get used to it. Soon enough, a girl could even run in those shoes, even though it’s not good for you. So if a girl can turn a pair of heels into an extension of their feet, why not train a little bit in heels for the stand-up techniques instead of not at all? At least then the training would be realistic in the situation a women might be in for attacks. The reality is, a lot, if not all, women wear heels. Why not avoid going to the ground with the attacker by not letting the heels prevent you from escape? Also, the hair pulling techniques seem like only a way to prolong the process. Why not strike, claw and dig if both hands are free? Also, the head tends to rear back when hair is pulled (this is obvious). The video should (in my opinion) adjust the training to deal with more naturalistic human responses. The question is left open and would be helpful if it were answered, and that is: “What do we do (or expect to do) if the technique works [we disarm the gun/knife].” I know as a self-defense coach myself, there is all sorts of liability issues with giving advice on these highly-dangerous scenarios, however, these aspects (especially in your basic course) should be touched on. If weapons are involved, when do we run? At what range or in what situation is it best to run? If we get the gun/knife, do we simply threaten to shoot & call the cops or do we place a round in his kneecap? If the need arises, where is the best place to shoot? Do you advocate that your Women Empowered ladies learn or take a separate course on gun training and safety? With this being said, I must commend Sage Gracie as she states plainly after executing an example of the “Armbar” (Arm break/lock), “Make sure you break the arm.” This is a saving grace to the lesson as it had appeared (to both Jenny and myself) that the student would simply hold/ask them to drop the weapon. In self-defense, do not give the attacker that level of mercy. Emphasis is placed on technique, which is only one (albeit large) piece of the puzzle. Rener says several times in the last lesson, “(When/If you gain control of the weapon) The choice is YOURS.” And it is! But what ARE your choices? In the Mindset Minute, he leaves you with only a partial answer to this question. He says, “Know one thing, break distances or do something to ensure he doesn’t take it (the weapon) back and use it on you.” This is true. But as a coach wishing to give my students ALL available information, I’d want to make sure they know all the available options. *Michael Joyce is the owner and head instructor of the ChenCenter & the Golden Thread Workshops in Winston-Salem, North Carolina where he has lived and taught for over a decade. Jennifer Pruna Joyce is Coach Joyce’s wife and is an aspiring writer & photographer who has recently graduated from Appalachian State University and is just now learning the skills necessary to be proficient in self-protection.